Why Granada is a great destination for digital nomads? Granada is an amazing city, rich in history and culture. There is a real buzz in the place and this helped me be more creative and productive during my stay in Granada. It has one of Spain’s most important Unesco World Heritage Site’s Alhambra Fortress and Palace which was just amazing to view everyday. Alhambra is only 5 minutes walk from the center of Granada. 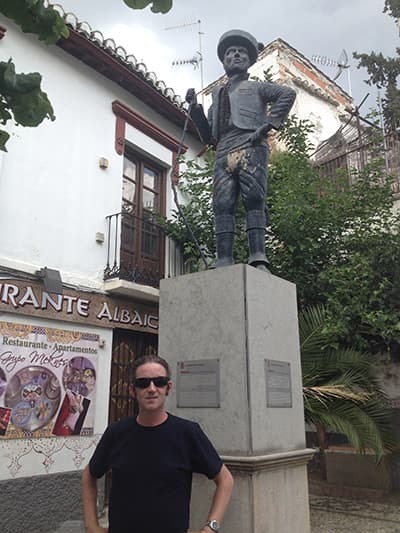 Me with King of the Gypsies Sacromonte, Granada. 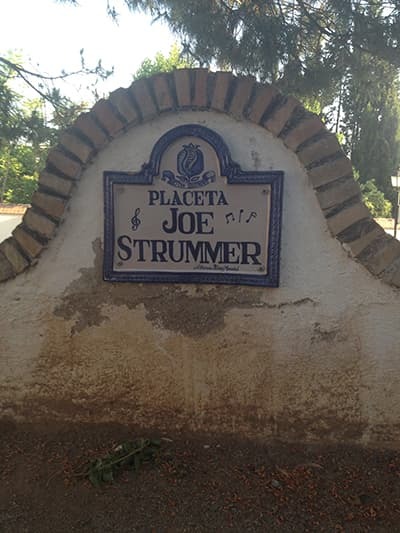 Placeta Joe Strummer, Granada. Joe Strummer from The Clash spend some time in Granada during the late 1980's. They named this small square after him. Granada is easy and inexpensive to reach. Budget airlines such as Ryanair, Easyjet, Vueling and Aer Lingus all into fly to the region from anywhere in Europe. 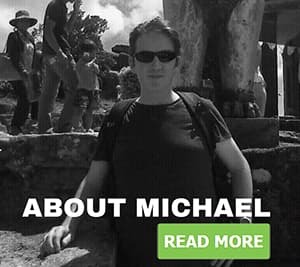 Always check Skyscanner for the cheapest possible flights. The two main airports in this region are Malaga (1 hour 40 min to Granada) and Sevilla (2 hour 40 min to Granada). It only costs €13.72 one way from Malaga main bus station to Granada. This was the route I took to Granada. 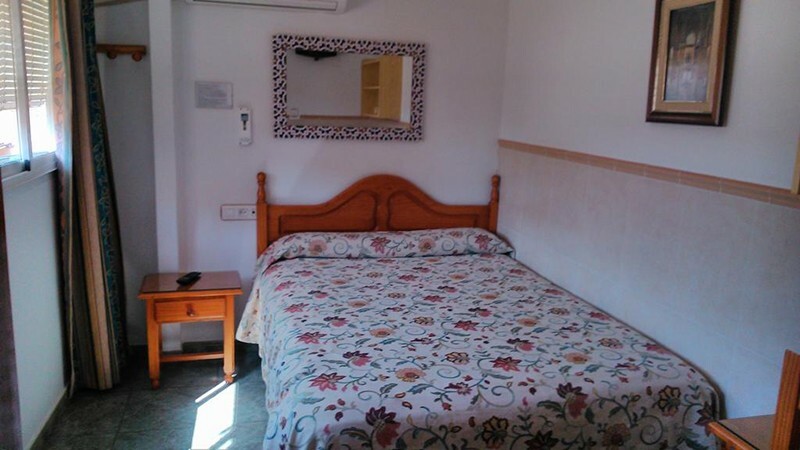 Granada has some of the cheapest accommodation options in Spain. It is possible to get a dorm bed in a hostel for under €10 per night. Check out this article on the Best Hostels in Granada. I stayed at the AB Pension Granada where a private room cost us only €22 per night during the week and €33 per night on the weekends. (I always stay with my wife and toddler, so this price included them of course.) The receptionist in the Guesthouse was very good and on many occasions give me excellent directions to different sights. Address: Infanta Beatriz 3, Ronda District, 18004 Granada. Pensión El Hidalgo is another good option. 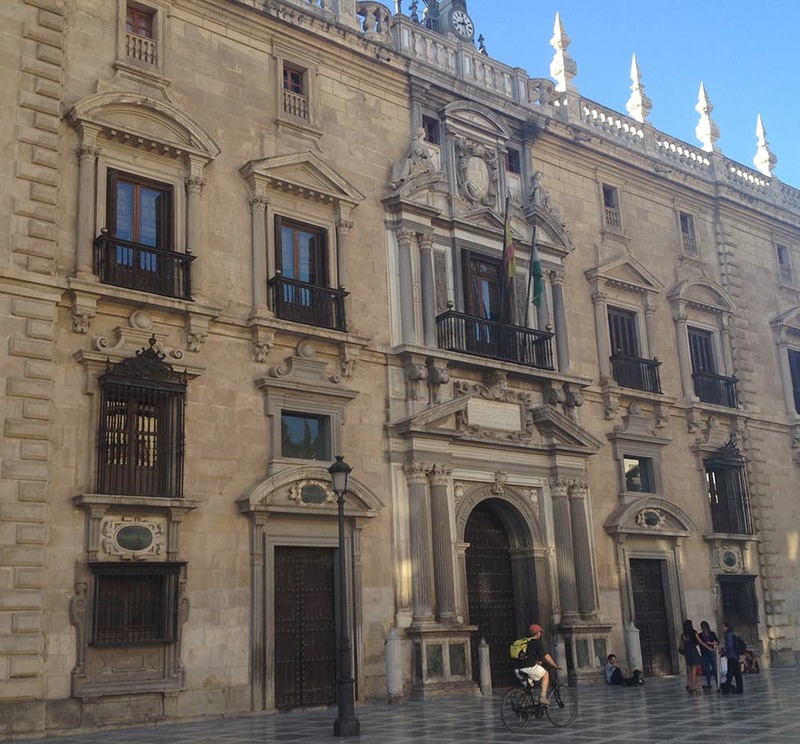 It's located in the center of Granada only a 7 minute walk to Granada Cathedral. 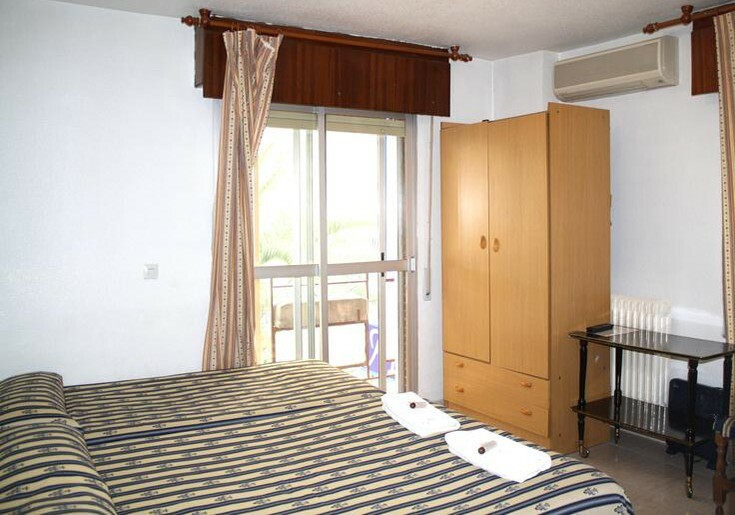 It offers a 24-hour reception and rooms with free Wi-Fi and a TV. This budget pension gets very good reviews online. Address: Horno Espadero, 8, Granada City Center, 18005 Granada. Airbnb is another good option for Granada. 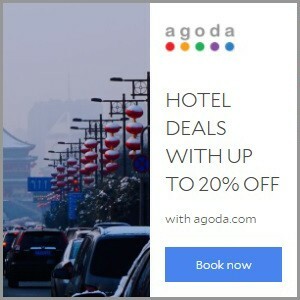 If you are not a member of Airbnb yet, sign up here and you will get a bonus €35 OFF your first Airbnb booking. Granada is slightly cooler than the rest of the Costa del Sol during the summer. It is cooler because it is almost 700 meters above sea level and there is always a nice breeze. The are two excellent Irish Bars, Oscar Wilde's and Hannigan’s. Both are managed by a very friendly and helpful Irishman named Paddy. A large local beer costs approx €3 in both bars. Granada also has a very diverse nightlife scene which caters for every budget. There are some very experience and trendy cocktail and whiskey bars. On the other end of the scale there are many drive/grungy/rock bars and these are normally very cheap. 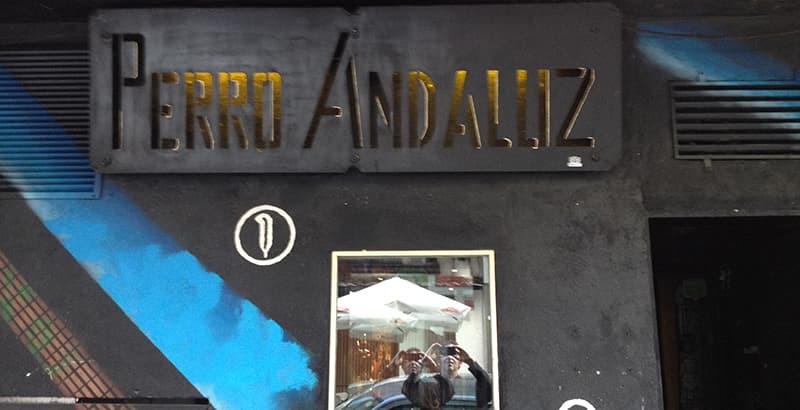 Check out Perro Andaluz Bar (The Andalusian Dog) below. This rock bar serves .4 draft beers for only €1.20, small shots for only 50 cent and €1.00 for a selection of mixed drinks. If you are looking for a concentration of bars, then Calle Prdro Antonio de Alarcon is the street for you. Granada has excellent food and the best tapas bar culture in Spain. Anywhere else in Spain you can’t normally choose your tapas. It is different in Granada. When you order a beer (large or small) and you get a choice of a tapas. Some tapas bar's offer a choice of 12 different tapas. 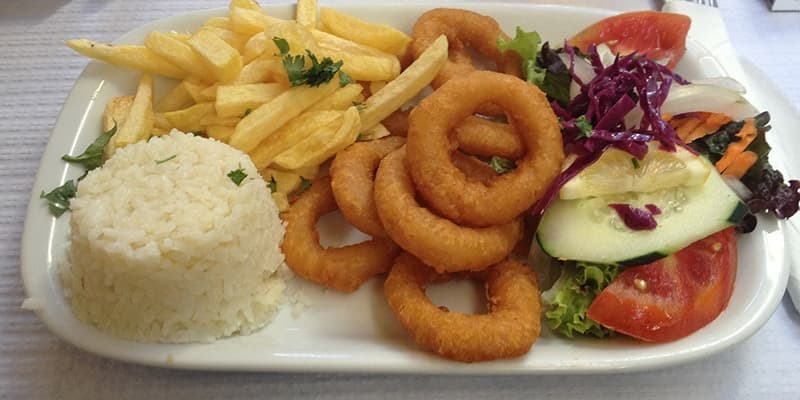 While in Granada I got to love Calamari and Spanish stew. One of the best squares for tapas is Plaza de Gracia. There are 5 or 6 Tapas bars on this square and a children’s play area. 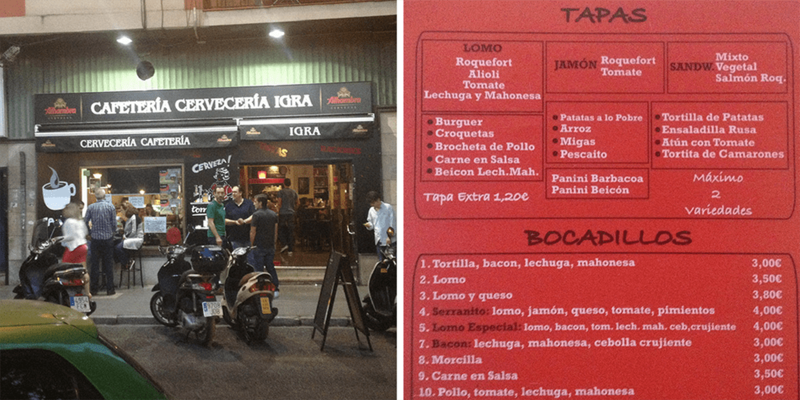 I recommend the tapas bar:- Cafeteria Cerveceria Igra. Cafeteria Cerveceria Igra Tapas Bar on Plaza de Garcia where you get to choose one of the above tapas with every drink for free. 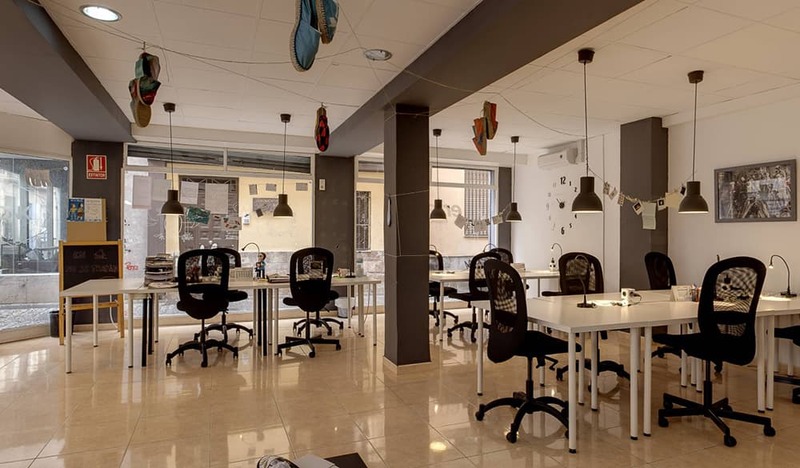 Errant co-working space is one of the best co-working spaces in Spain. The Owner/Manager (Nano) was very helpful. The wifi speed is very good at 30MB per second. They accept walk in’s. A lot of co-working spaces in Spain don’t accept walk in’s. I had this problem a few times in Spain. Errant charges €5 for a half day (9am to 3pm or 3pm to 9pm) or €10 for a full day. There are of course monthly packages. There is no package holiday tourism in Granada, mainly because there is no beach close by. An example of some the beautiful buildings in Granada. And we have a Cofamily Coworking, the only coworking for parents!! !